The candidates have some interesting perspectives on the matter. Meanwhile, the same hundreds of ballots from the same corners of Hoboken and the Hoboken Housing Authority is plagued with the viral disease of vote-by-mail not being mailed. MSV will have an exclusive statistical breakdown feature detailing exactly what is going down. Anyone with detailed insight into the rampant on-going vote buying is encouraged to reach out for assistance. Da Horsey is willing and eager to help you protect your legal exposure in any vote buying scheme. Please contact smartyones@me.com. Confidentiality will be maintained at your direction. Now for an analysis of the vote-by-mail chatter at the mayoral forum. Assemblyman Ruben Ramos hasn't found religion on vote buying and refused to endorse the mayor's suggestion not to pay "campaign workers" but he did reference problems with the Raia-Mason slate and Tim Occhipinti's campaign. He also lobbed a bomb back to 2007 to the mayor's former council campaign which she immediately rebutted as false. Ramos was a strong backer of Timmy Occhipinti in the 2010 fourth ward special election riddled with systematic vote-by-mail problems. Almost 500 vbms were submitted in that race and the Hudson County Board of Elections tossed almost 100 out of the gate they were so blatantly and obviously fraudulent. You didn't hear a peep out of Assemblyman Ramos then and even some among the Old Guard whispered he was making a big mistake putting his statewide office into disrepute by connecting himself so closely to Timmy Occhipinti's controversial campaign. Ramos' mom actually sat next to a Beth Mason political operative named in the voter fraud on more than one occasion in that election cycle prior to the 2010 special election. MSV back then had an encounter with Ramos right outside the Occhipinti campaign office while speaking to its campaign manager Jamie Cryan. They did not like the attention MSV generated on voter fraud and the exclusive story broken on MSV regarding the one to one absentee ballots of "campaign workers" uncovered leading into election day and picked up by PolitickerNJ. A certain councilman's mother was reportedly screaming how stupid that information was allowed to escape the campaign leading into the election. As for Tim Occhipinti, he skirts most of the voter fraud issue and there was angry murmuring in the crowd when he began speaking as it's an open secret the vast bulk of vote-by-mails being churned out by the hundreds in the recesses of the fourth ward are once again expected to come in for himself and his running mates. He did say the vote-by-mail ballots are not being returned to the Raia-Mason slate office on Washington Street. At least that part is true. MSV can confirm they are going to the Hudson County Board of Elections - not by mail -but by messenger! There's no reports of basement ballot drownings this time. Recall the Carmelo Garcia Rat Tapes and the transcript of "750" lost vbms last November. 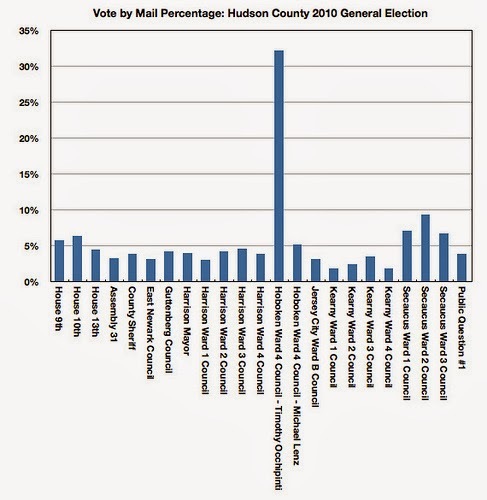 Vote-by-mail percentages in Hudson County from November 2010. Which of these lines doesn't fit? So unlike in the past, the problem is Timmy Occhipinti and his running mates are fighting a defensive action in advance of the November 5th election for what they obviously know will be another rainmaker tsunami of vote-by-mail ballots coming out of the Hoboken Housing Authority on their behalf. MSV can confirm there are already hundreds of the paper ballots coming out of the fourth ward as is typical from the corner of town which just loves campaigning for whoever doles out $40 a vote. In the video clip, Occhipinti throws a light dart toward Ramos complaining about irregularities of ballots in the senior buildings. It's just another front between the warring Old Guard campaigns. Word within the back of the fourth ward suggests it's Armageddon between the usual vote-by-mail soldiers in support of the Raia-Mason slate versus their one time allies (and vbm recipients) now divided in resistance led by HHA Executive Director Carmelo Garcia and his "tenant" groups on behalf of Ruben Ramos. But who has the cash now is the arbiter not who promises to pay later or so the word on the street says. Perhaps it's time for MSV and the Hoboken Journal to bring back its anti-voter fraud campaign "Operation Bounty!"